The no-nonsense Supreme Court judge has delivered a typically no-nonsense, thorough report. 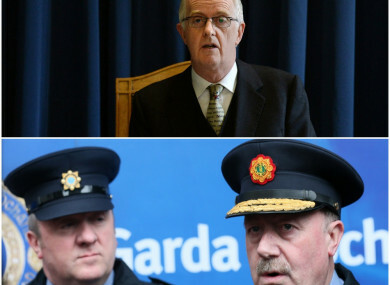 Mr Justice Charleton (top) was sharply critical of Dave Taylor (btm left) and Martin Callinan (btm right). IT’S JUST UNDER 11 months since the first interim report written by Mr Justice Peter Charleton eviscerated the claims made by Garda Keith Harrison. That report – based on around three weeks of hearings – almost hit 100 pages. This one released yesterday – based on roughly 80 days of evidence – goes past the 400 page mark and, this time around, it is Superintendent Dave Taylor who the judge has forensically undone. Judge Charleton’s approach throughout the hearings was very much a no-nonsense one, and that is certainly reflected in the report. He pierces through this incredibly complex and weaving story with precision, with a distinctive style that makes it eminently readable while also drawing conclusions on how his findings have wider implications. At a minimum, the garda press officer should be someone who undertakes relevant training. Experience of working in the press office should be regarded as useful for the job of directing it. Even more than that, an honest person is required. The task before the Supreme Court judge was by no means easy. He heard evidence from one that directly contradicted the evidence of the other numerous times. He had to unpick the saga and decide if there was a smear campaign against Maurice McCabe and, if there was, what form it took. The story as told by Superintendent Dave Taylor was brutally, thoroughly dismissed (more on that later) but he was faced with a harder task with the allegations against Martin Callinan. Did the most senior garda in the country deliberately spread false rumours about one of his officers? Fianna Fáil TD John McGuinness had told the Dáil in May 2016 that he had met the then-Garda Commissioner in a car park in January 2014 where he was told Maurice McCabe was “not to be trusted”. At the Tribunal, Callinan rejected saying any such thing. But, if it was to be accepted that Callinan was denigrating McCabe in private, it needed further corroboration. During the Tribunal hearings, Mr Justice Charleton said that he was given a public task to get to the bottom of these matters, and called for help from those who know anything in strong terms. “There is a patriotic duty to anyone who has information that could be of assistance to this Tribunal should come forward,” he said. A day before this infamous car park meeting, Callinan appeared before the Public Accounts Committee (PAC). The Comptroller and Auditor General – the head of the body which examines how public funds are used – Seamus McCarthy talked with the commissioner before the PAC hearing started. But the Tribunal wasn’t aware of this. It didn’t know any such conversation had taken place. The only reason it found out is because McCarthy decided to come forward. It was McCarthy’s testimony to the Tribunal that Callinan raised McCabe’s name and said there were sexual offence allegations against him. Callinan denied this. The judge accepted the evidence of McCarthy. Charleton noted: “He showed real public spiritedness in coming forward. As a constitutional officer, he has nothing to gain and nothing to lose. His evidence was coherent and convincing. Everything about how he gave his evidence indicated a sense of duty. There is not the slightest hint of any ill-motivation. While the cross-examination on behalf of Commissioner Martin Callinan was skilled, the truthfulness of Séamus McCarthy as a witness remained untouched. The same was true for the evidence from Fine Gael TD John Deasy. He testified to having a very similar conversation with Callinan on the exact same day. He came forward “in answer to the tribunal’s direct public appeal for relevant information”. “The evidence of John Deasy TD gave no hint of being motivated by sensationalism or by attention-seeking. Instead, the tribunal is of the view that his evidence was given out of a sense of duty,” Charleton noted. And again, RTÉ journalist Philip Boucher-Hayes came forward detailing a conversation he had with Callinan a month prior in December 2013. He claimed Callinan had disparaged McCabe to him in a private conversation. Mr Justice Charleton said: “Philip Boucher-Hayes came forward unasked and early in answer to the tribunal’s plea for assistance in February 2017. Everything about his evidence suggests that he did so out of a sense of public duty and his demeanour in the witness box demonstrates the continuation of his public spirit. With these men demonstrating “public spirit”, Charleton was able to find with authority that Callinan wasn’t telling the truth in these situations and solidify the case for McCabe being subject to a “campaign” to disparage him in influential circles. Almost every syllable from Charleton’s report that mentions Dave Taylor drips with disdain for the evidence given by the former head of the garda press office. “Instead of telling the truth to himself, or to the Tribunal, [Taylor] set out to destroy people by associating himself with Maurice McCabe and undermining the wife, Nóirín O’Sullivan, of one of the detectives leading the investigation against him,” the judge said. Let’s have a rewind on Taylor. He was appointed head of the garda press office by Martin Callinan in July 2012. Sometime in the summer/autumn of 2013, Taylor said he was told by Callinan to contact members of the media and begin to “do down” McCabe in his interactions with journalists. And Taylor said he did what he was told to do by his boss. He couldn’t say where he told a journalist the stuff about McCabe. He couldn’t say when. He couldn’t say what their reaction was. He said they didn’t ask any follow-up questions to what he was telling them. The journalists he said he told denied any such thing happening. Taylor was moved out of the garda press office shortly after Callinan’s resignation in March 2014 by his successor Nóirín O’Sullivan. The following year, he was arrested and suspended for allegedly leaking information to the press. Nóirín O’Sullivan’s husband – who is also a garda – was one of those investigating the alleged offence. Taylor was still suspended when he made his protected disclosure containing the allegations he was directed to conduct a smear campaign against McCabe by Callinan. Everywhere Taylor is mentioned in the report, the judge is dismissive. He wrote that the superintendent was “deceitful”, had “lied” to the Tribunal, had given “daft evidence” and had “taken in” journalists with his negative commentary on McCabe. In conclusion – and it’s worth noting it in full – Charleton roundly dismissed Taylor. This tribunal has no option but to find that Superintendent David Taylor is a witness whose credibility was completely undermined by his own bitterness and by the untruthful nature of his affidavit in the judicial review proceedings that he intended to commence before the High Court. The truth is that Superintendent David Taylor completely understated his own involvement in a campaign of calumny against Maurice McCabe. He claimed, for the first time, while giving evidence to the Tribunal that he was acting under orders. That was not the case. The Tribunal is convinced that he pursued a scheme that somehow evolved out of his cheek-by-jowl working relationship with Commissioner Callinan. Their plan was that there was to be much nodding and winking and references to a historic claim of sexual abuse while, at the same time, saying that the Director of Public Prosecutions had ruled that even if the central allegation did not have credibility issues, what was described did not amount to an offence of sexual assault or even an assault. So the campaign was found by Charleton to have taken place, what now? The Supreme Court judges makes a number of prescient points about what this Tribunal will – and should – mean going forward. With public discourse dominated with ideas around “spin”, Mr Justice Charleton had some choice words for how it has become almost like a norm. And, after finding failures within State institutions such as the gardaí and Tusla, Charleton prefaces his recommendations going forward contesting the real role a Tribunal can have in bringing about real change. “Whereas many are cynical and claim that tribunals are a political means of sidelining important issues and covering matters within the power of government with a lachrymose sauce about the need for fair procedures, a Tribunal, having completed its work, might hope that thereby some improvement could occur,” he said. A Tribunal should speak freely and a Tribunal should in no way be trapped by the temptation of cynicism that nothing may change. The judge does not mince his words in these recommendations. Citing airline travel, he says that when something goes wrong there, there’s an all-out effort to discover why and to learn from errors. He said that “regrettably”, neither Tusla nor the garda organisation currently displays that mentality. While at least commending Tusla for changing procedures within its organisation and being withering in its criticism of these failures before the Tribunal, the judge is far less impressed with the gardaí. He praises the individual gardaí on the ground, the ones who are devoted to duty and ponders how dispiriting it must be for them to read what is in his report. Concerns over the force highlighted over a decade ago in the Morris Tribunal remain a concern now. An Garda Síochana has a lesson that “badly needs to be learned” and that is that duty to Ireland is above group loyalty. He goes even further, calling for a “cultural shift requiring respect for the truth”. Comprehensive reform of promotion within the gardaí is recommended. He even uses the example of cycle lanes being ignored by motorists to highlight the degree to which gardaí are often rarely seen on our streets. “Ireland, while not having any immediate terrorist threat, but with a serious organised crime problem, has a real problem due to the invisibility of our police force,”the judge said. Mr Justice Charleton also said that An Garda Síochána is crying out for self-analysis. If that existed, there may have been no need for these years and years – as well as millions of euro – spent trying to get to the bottom of these scandals that lay within. Ultimately, Mr Justice Charleton finds that Maurice McCabe was a good, principled man who tried to public good – just like Boucher Hayes, Deasy and McCarthy. For that, he was disparaged by the head of the police force in this country. The judge said McCabe was “repulsively denigrated for being no more than a good citizen and police officer”. By investigating this smear campaign, “other aspects of our national life have been laid bare,” he notes. Within the pages of this report are detailed those women and men who have done their work well and who try every day, as police officers, social workers and administrators, to do their best. But not all. Not every person seeks either to uphold the highest standards or to strive for them through daily work. David Taylor is one such person, according to this report. Martin Callinan is another. And what was the result of them not seeking to uphold these highest standards? Email “Taylor torn down and Callinan undone: Judge Charleton's forensic analysis on a national scandal”. Feedback on “Taylor torn down and Callinan undone: Judge Charleton's forensic analysis on a national scandal”.